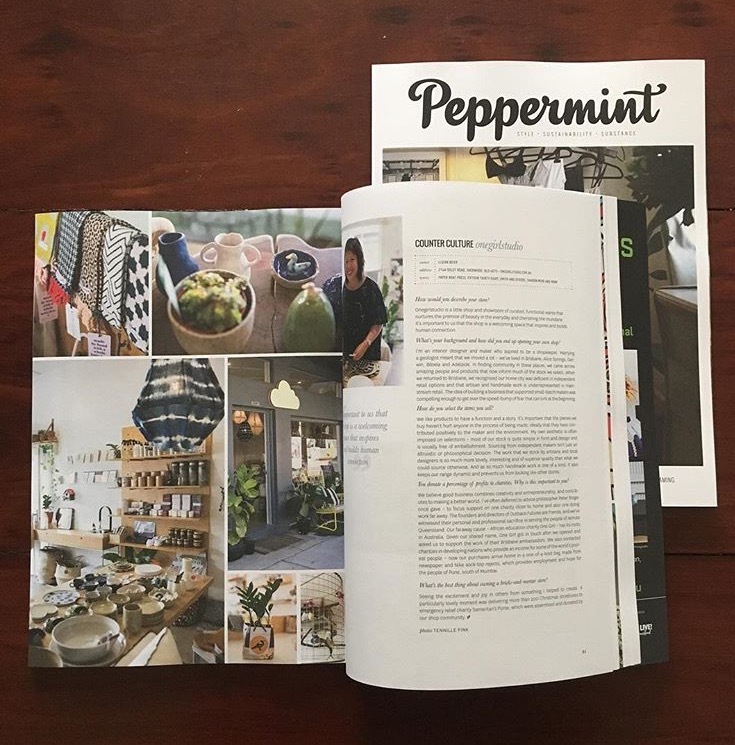 Peppermint magazine is a beautiful and substantial magazine based in Brisbane and we were so grateful to be included in Issue 34! Name(s) of the store owner(s)? If multiple, are you any relation to each other? How did the store come about? What are your backgrounds? I am an interior designer and maker who in my heart of hearts aspired to being a shopkeeper. Marrying a geologist has meant that we have moved a lot. We’ve had 15 addresses in total; in Brisbane, Alice Springs, Darwin, Biloela, Adelaide. In finding community in all of these places, we came across amazing people and product which now informs much of the stock we select. In returning to Brisbane, we recognised that our home city was deficient in independent retail options. It also became apparent that artisan made and hand made work is incredibly under-represented in mainstream retail; and furniture and lighting that was specified in my design work was often trade only and difficult to access by the general public. Coupled with my shopgirl ambitions, the idea of building a business that supported small batch makers and that made accessible beautiful, quality wares and furnishings, was compelling enough to get over that giant speed bump of fear that can lurk at beginnings. A little shop + showroom of curated functional wares that nurtures the premise of ‘beauty in the everyday’ and ‘cherishing the mundane’. It is important to us that the shop is a welcoming space that inspires and builds human connection. How do you select what you sell? There is so much incredible work being made by incredible people, we wish we could stock so much more. We like product to have a function and a story. It is important that what we buy hasn’t hurt anyone in its process of being made; ideally that it has contributed positively to the maker and the environment. My own aesthetic is often imposed on selections; most of our stock is quite simple in form and design and is usually free of embellishment. Which items do you make yourself? I make the braille artworks and some jewellery. We also still have some cushions that were made together with the African Refugee Sewing Group in Adelaide. Why’s it important to you to support artisanal and local designers? In the end, it’s not really an altruistic or philosophical decision. The work that we stock by artisans and local designers is so much lovelier, interesting and of superior quality than what we could source otherwise. As so much hand made work is one of a kind, it also keeps our range dynamic and prevents us from looking like other stores. Do you find consumers are willing to pay more for ethically-produced, small batch items? Do your customers like to know the stories behind their purchase? Not always (and it is understood that not everyone can). We hope we can connect with more customers who do value the person behind the product. A little business like ours can only exist with the support of mindful shoppers who value the heart made work of artisans and craftspeople and the provenance of things; or those who choose to support small, local, independent business to enrich the community in which they live. We are equally as grateful for our regular customers who shop with us just for the beautiful and ever changing wares and for unique and memorable gifts. You’re a qualified built environment specialist. How does the shop fit in with your work as a design consultancy? Having worked mostly in architectural studios, it actually took me a little while to understand how the shop and the design consultancy could best complement each other. It has proven that the shop allows potential clients to check me out before they commit to working on a project together. It is, after all, an essential ingredient to a successful project that communication between client and designer is effective and enjoyable. I am also easily accessible by clients if there are any questions; a real life chat is still the most efficient method of clarification and resolution. Having the shop forces me to review product daily which is invaluable for sourcing furniture and fittings for interior projects. The shop also provides opportunities for great pricing for clients. Tell us about the events you host. We feel very fortunate to be part of a community of amazing women who have set out to generously impart their talents and experience to the next generation. The ‘kids in the studio’ classes that we host was born from our relationship with Melissa Guyatt, who has been upskilling children at River Bend books and council libraries for years. We have since extended our school holiday program from Interior Design + Architecture to include Fashion Design (with QUT’s Melanie Finger) and nanna craft that can keep your hands from ever being idle again (hand sewing with Thimble Arts, embroidery and cross stitch thanks to my part time job at high school in a craft shop). We also empathise with many friends and colleagues who can’t make it out to the suburbs during business hours or Saturday sports, so occasionally we open late, serve champagne and put our gift -wrapping skills to use. What’s your favourite thing about having a bricks-and-mortar store? And any stand-out moments or memories so far? I think my favourite thing is seeing the excitement and joy in others from something I helped to create. This is the same thrill of interior design. It was a lovely moment to deliver 200+ Christmas shoeboxes to Samaritans Purse, assembled and donated by our shop community. Tell us a little about the charitable donations the store makes. We believe that good business combines creativity, entrepreneurship and contributes to a making a better world. Sometimes acknowledging the need in the world is overwhelming and so I’ve often deferred to advice Peter Singer once gave, to focus support on one charity close to home and one doing work far away. Our far away charity One Girl has its roots in Australia. One Girl contacted us soon after we opened (given our shared name) to support the work of their Brisbane ambassadors. We loved hearing Chantelle Baxter speak at a peppermint mag event. Also, in order to make meaning of our significant spend on packaging, we had been communicating with various charities in developing nations who supply handmade newspaper bags, providing an income for some of the world’s most poor. It wasn’t until one of our lovely customers connected us with her colleagues in India that the idea grew wings. Onegirlstudio purchases can now arrive home in a one of a kind bag made from indian newspaper and nike sock top rejects; materials otherwise destined for landfill. The labour provides employment and hope for the people of Pune, south of Mumbai. We hope we will contribute to changing the retail landscape in Brisbane to be inclusive of small batch makers and women led business.